Originally published in 1974, How to Grow More Vegetables, Eighth Edition: (And Fruits, Nuts, Berries, Grains, and Other Crops) than You Ever Thought Possible on Less Land than You Can Imagine1 remains a vital resource for farmers, agricultural researchers and planners, sustainability activists and home gardeners, as the world confronts the challenge of feeding a global population of 7-9 billion without access to the cheap fossil fuels that have run “industrial” agriculture for the last century. Thanks to skyrocketing oil prices, Peak Oil is no longer just a theory. The failure of oil production to increase at the same rate as heavy demand from developing countries like China and India has driven the price of oil to record levels. Owing to the heavy use of fossil fuels in contemporary agriculture, food prices have tended to increase at a comparable rate. Scientists predict that food shortages related to the loss of mechanized agriculture will likely be compounded by extreme weather events related to climate change. With the Midwest, regarded by many as the world’s breadbasket, undergoing the worst drought in 56 years, we may be facing major global famine as early as September or October 2012. World leaders are already preparing for skyrocketing food prices, food riots and possible starvation for as many as 1-2 billion people. Jeanon’s book is unique in that it combines biointensive theory and research (with a fifty-three page bibliography) with a cookbook-style manual for households preparing for a future in which they grow most or all of their own food. Although most people associate “technology” with machines, I use the word in its literal sense: “science or study of the practical uses of scientific discoveries (Collins Modern English Dictionary).” The Chinese method of “miniaturized” biointensive agriculture is 4,000 years old (see F.H. King’s 1911 book about this method, Farmers of Forty Centuries: Organic Farming in China, Korea, and Japan). However the “GROW BIOINTENSIVE” methods described in How to Grow More Vegetables are also informed by thirty plus years of research into soil, plant and ecological science. Thus they represent a novel technology in the truest sense of the word. The GROW BIOINTENSIVE approach, developed by Jeavons and Ecology Action of the Midpenninsula (Palo Alto), is centered around preserving the microbial life (bacteria and fungi) that are abundant in healthy soil and which are essential to plant health and growth. Up to 6 billion microbial life-forms live in one 5-gram sample of cured compost (about the size of a quarter). This microbial life, so essential to plant development, is destroyed by specific aspects of industrial farming. This is the main reason for the relatively poor yields of factory farms (in contrast to traditional biointensive methods). It’s also responsible for the extensive destruction of our topsoil. Repeated plowing and chemical fertilizers disrupt the delicate ecology of topsoil organisms, and pesticides and herbicides are as deadly to soil bacteria and fungi as they are to insects and weeds. In his introduction, Jeavons reveals that industrial farming destroys approximately six pounds of topsoil for each pound of food it produces. China’s soils, for example, remained productive for more than 4,000 years, until the adoption of mechanized chemical agricultural techniques led to the destruction of 15-33% of their agricultural soil. Another example is North Africa, which was the granary for Rome until overfarming transformed it into a desert. According to Jeavons, the world only has enough topsoil left to last 42-84 years. Based on thirty-plus years of horticultural research, Ecology Action members have ascertained that the GROW BIOINTENSIVE method, in the hands of a skilled practitioner, can produce enough food to feed one person (on a vegan diet) with 4,000 square feet of land. This contrasts with the 7,000 square feet required to feed a vegan using fossil fuels, farm machinery and conventional chemical or organic techniques. Without fossil fuels and machines, the amount of land required (using conventional chemical or organic techniques) would be 21,000-28,000 square feet. At present it takes 31,000-63,000 square feet per person to produce an average US diet (including eggs, milk, cheese, and meat), using fossil fuels and mechanization and conventional chemical or organic techniques. In addition to increasing caloric production by 200-400% per unit of area, the GROW BIOINTENSIVE method also significantly reduces water consumption (by 67-88%) and increases soil fertility (by 100%). 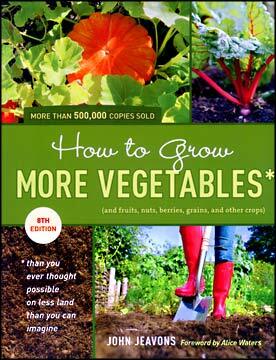 Most of How to Grow More Vegetables is a detailed instruction manual describing how an average family (1-4 people) can grow the right kind of crops to supply most, if not all, their food requirements. Jeavons starts with the assumption that most readers are beginning gardeners and covers basic topics such as soil preparation (by double digging), composting techniques, maximizing soil nutrients (by adding compost and growing crops that increase carbon and nitrogen content), water management, seed propagation, non-chemical pest control and companion planting (growing plants together that enhance each others’ growth or discourage pests). Nearly half the book consists of tables with basic information about the spacing, care and calorie and protein content of specific crops and master charts showing where, when and how much of each variety to plant. All the master charts emphasize maximum carbon and calorie production in the space available. They are based on the principle that 60% of a biointensive garden must be devoted to carbon-and-calorie crops – in other words, crops that produce large amounts of carbon (via leaf and stalk residue) in addition to substantial calories. The former is essential to maintaining the health of the soil and the latter that of the gardener (most people require 1,500-2,000 calories daily to maintain body weight). Examples include corn and wheat, planted along with legumes (peas, lentils, or dried beans) to replace soil nitrogen. An additional 30% of garden space should be devoted to high calorie root crops, such as potatoes. No more than 10% should be devoted to low calorie vegetables and fruits that provide missing vitamins and minerals. Jeavons also makes the assumption that all gardeners advance quickly with practice. Thus he starts people with a 100 square foot (ten feet by ten feet) one person mini-garden. Every year he has them double the size and expand the number of crops. By year four, he has them planting 380 square feet (nineteen feet by nineteen feet). He starts more experienced gardeners off with a 1,302 square foot (36 feet by 36 feet) four person family garden. The techniques described in How to Grow More Vegetables are useful whether people are gardening on their own land or starting a community or guerrilla garden. For apartment dwellers interested in small space and vertical gardening, the film Urban Permaculture by permaculture guru Geoff Lawton is probably more appropriate. This article was posted on Monday, July 23rd, 2012 at 7:59am and is filed under Agriculture, Book Review.